August 11, 2017. Tuguegarao City. 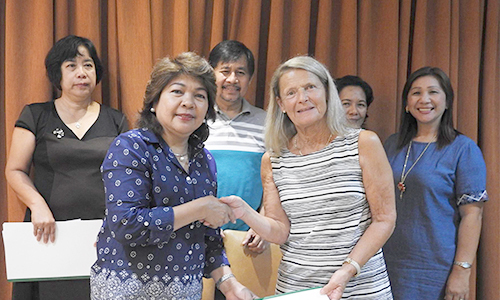 Canadian Executive Service Organization (CESO) assured its full support to Cagayan State University through a signing of a Partnership Action Plan by CSU President Urdujah Tejada and Lead Volunteer Adviser Elizabeth Lane and Mr. Matt Navalta, representative of CESO to the Philippines. The Partnership Action Plan contains all assistance to be extended by CESO to CSU. During the exit conference held on August 10 at the CSU Conference Hall, the broad needs of the campuses were summarized as an offshoot of the campus visits done by VLA Lane. Exchange programs, capacitating faculty members in writing proposals for funding, product development and labelling, eco- tourism development, fabrication of metals and improvement of the database through a more efficient management information system are among those from the 49 identified assistance by the CESO. The organization shall provide experts to assist the university to fulfill its identified needs. Lane thanked the CSU community for its gracious hospitality and its collaborative effort to make this partnership promising. She said she looks forward to a successful partnership with the university seeing in the officials and the CSU community huge enthusiasm and its strength to excel in instruction and community development.